So last week I complained that the Random iTunes Fairy has been serving up too much Bob Dylan. And she responds by dropping the second Robyn track in three weeks. I’m not sure what to make of that, but somehow I think I’m being taunted. Damn you, Steve Jobs! Any reader of Entertainment Weekly has probably noticed the crush that publication has on Robyn. The degree to which they evangelize for her is almost comical. Regardless of my opinion of the pixie-like Swedish performer, I love to see that kind of promotion of an underdog. Hell, I’m the guy who’s in the midst of Ron Sexsmith Weekends on this blog. When you love something, the desire to shout about it from the rooftops is a strong one. 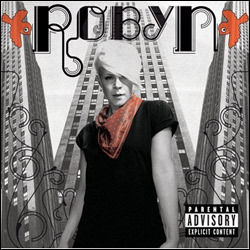 Personally, I think EW piles it on a but too thick when it comes to Robyn. She’s talented, no doubt, but they risk overpraising her to the point that all she can do is disappoint. And that’s not doing her any favors.